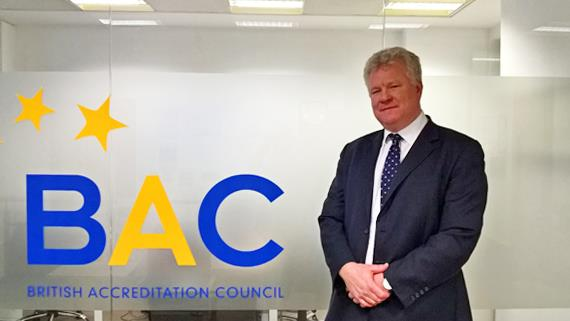 This week, we interview Paul Fear, CEO of the British Accreditation Council (BAC), about the association’s activities and trends in the independent FE/HE sector in the UK. Firstly, can you give a little background on the British Accreditation Council (BAC)? The British Accreditation Council for Independent Further and Higher Education is a charitable organisation registered in England and Wales and a not-for-profit organisation. As such, we are required to comply with UK Charity Commission guidance and comply with English company law. The BAC was established as a joint initiative between the British Council and Department of Education in 1984. The original BAC remit was to oversee the independent further and higher education sector in the UK and to ensure that educational and governance standards within the sector were rigorous. BAC was also charged with raising educational and governance standards across the sector. This has been achieved by developing a set of standards against which institutions are judged and accredited. BAC institutional reports are designed to provide transparency to all stakeholders and provide in-depth but accessible commentary. Today, BAC accredits more than 230 institutions in 20 countries although most accredited institutions are in the UK. BAC is increasingly involved in the accreditation of education and training institutions across the UK and internationally and has developed a unique capability to work with a broad range of further and higher education institutions. In addition to our accreditation activities we are increasingly involved in international consultancy. We have worked with governments and NGO’s in Bahrain, Kazakhstan, Kosovo and Albania and in capacity building projects designed to improve the governance and outcomes in further and higher education. Within the UK, BAC holds statutory responsibility in that all BAC-accredited institutions can accept international students on academic or vocational courses for up to six months. BAC is one of two UK full members of the European Association for Quality Assurance in Higher Education (ENQA) and is listed on the European Quality Assurance Register for Higher Education (EQAR). BAC also holds full membership of INQAAHE (International Network for Quality Assurance Agencies in Higher Education) and CIQG (Chea International Quality Group). What has BAC been up to in recent months? The last six months have been a very exciting time for BAC. Since February 2017 we have been developing the International Language Provider scheme (IELP) scheme. The scheme will offer English as a foreign language (EFL) providers the opportunity to communicate to their students their commitment to quality education. Given our experience we believe this will help to strengthen confidence amongst students and partners. All of our experience suggests that accreditation and the transparency and confidence it instils has a significant impact on an institution’s ability to attract students and develop partnerships. How has the last year been for the independent FE and HE sector in the UK in terms of international student enrolment? The independent FE sector has been hard hit by the costs associated with Tier 4 compliance which has meant many have opted to withdraw from the long-term international student market. The impression created by Brexit that the UK doesn’t welcome international students is not helping and does not reflect the reality of the experience of international students. However, we are seeing a number of institutions responding by developing innovative curriculum models that allow students to study in their home countries, and, in some cases, travel to the UK for short intensive study periods. Adversity is certainly encouraging innovation but there is no doubt that overall the independent FE sector is under considerable pressure. The HE sector is facing rising competition as student caps are lifted with the big-name universities expanding to meet demand, but this is creating problems for universities whose brands are perhaps less well known. The sector is also facing the same difficulties as the FE sector. The good news is that the UK has a highly successful FE/HE sector and demand for its education is increasing around the world so there are lots of opportunities out there. The government is increasingly aware of the importance of the FE/HE sector in terms of exports but also as a mechanism for projecting soft power. There are a number of support mechanisms to support institutions who want to expand overseas, and I think these will become more prominent over the course of 2018. So, it’s been a tough few years and the UK market will remain very competitive but there are many opportunities to UK institutions internationally. It also seems likely that international students will be removed from the immigration statistics which will help dispel the myth that the UK does not welcome students and send out a positive message to international students that the UK offer fantastic education opportunities for international students as well as supporting a less politicised discussion about the benefits of international students to the sector and their very significant contribution to the economy. What issues are affecting the sector at present? The biggest issues facing the sector are the Tier 4 requirements, the impression created by Brexit that international students are not welcome. In the FE sector, spending restrictions mean opportunities for outsourcing of delivery have been reduced. The HE sector is seeing increasing competition for students. We shouldn’t underestimate the opportunities for the independent sector in meeting international demand for UK education. New thinking and innovation are opening up opportunities for the independent sector for the benefit of students everywhere. Our predominant readership is comprised of agents, so can I ask if you have any resources or activities that are targeted at agents or that might be useful for them? We have developed a marketing support pack for education providers and agents to raise awareness of the benefits of BAC accreditation. The pack contains a tailored BAC business development presentation, information on BAC schemes and services and the BAC promotional brochure to help agents promote BAC-accredited organisations to students. The intention is to support agents in their activities, increase their understanding of BAC’s work and in turn raise their potential in building successful relationships with partners and students. BAC also run a successful webinar series and we would be happy to connect with agents should they wish to learn more about BAC – agents who are interested in attending a bespoke webinar please get in touch with me to arrange this service. Can you tell us a little more about the IELP scheme ahead of its launch? The scheme has been under development for the best part of the last 12 months. As part of the development process we have talked to key figures in the industry, set up a scheme development working group and held a closed consultation on the proposed standards. It has been quite a task! The scheme has been designed to represent ‘best practice’ in the EFL industry and support the raising of standards across the industry. BAC accreditation will send a clear signal to students, agents and other stakeholders of the institution’s commitment to quality and transparency. As I have said earlier, all of our experience suggests students and other key partners, such as governments and training agencies, welcome the commitment to quality and transparency demonstrated by BAC-accredited institutions. The benefit to institutions, of course, is the increase in student numbers they experience as a result of accreditation. The marketing support tools to help institutions to explain what BAC accreditation actually means to their stakeholders. This has been well received by accredited institutions and seen as a really positive and supportive innovation. What else does BAC have planned for the year ahead? The start of 2018 has already been busy! The importance of quality assurance is becomingly increasingly well recognised by institutions, governments and of course, students! Demand for our services is increasing both in the UK and internationally. We will continue to develop our quality assurance programmes and make sure they meet international expectations and represent best practice. This is an ongoing process and something we do on a regular basis. We will also be stepping up our communication efforts so that all stakeholders get a better understanding of what BAC accreditation actually means and how it promotes transparency and supports and encourages institutions commitment to high-quality education and training.